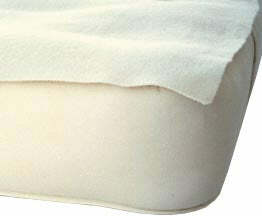 Pure-Rest Wool Mattress Pads. Natural, breathable moisture protection for Mini Co-sleeper, Crib and mattress sizes Twin through King. Made in USA. Twin XL is great for just your half of a King size bed. Known as "Untreated Fine Wool Moisture Pad" by Pure-Rest. Made in San Diego, CA, USA. 100% wool mattress pads. Very fine wool, 19-22 microns (this is the good kind - finer means more fibers closer together for better moisture protection, which is the point of them, after all). Moisture resistant mattress protector. Breathable. 1/8" thick, hypoallergenic, anti-bacterial, chemical-free, dye free, flame resistant. Made with untreated wool from USA free range sheep. The sheep are not treated with antibiotics or hormones. They free range graze on lush fields that is not treated with pesticides or herbicides. Great for keeping your mattress extra safe from most kinds of liquids or stains. The moisture pad is thinner and softer than others due to it being slightly more felted. 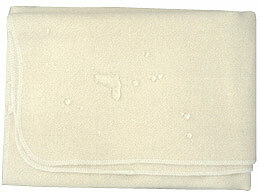 This pure wool is felted here in the United States to create a perfect pad to resist liquids. Softer than competitor wool pads so you don't get that itchy feeling. No treatments, no plasticizers. Natural Elastic straps in size twin and up. Soft, comfy (no crinkles) and not sweaty. I (Karen) have one on each of our wool beds in our house. I don't actually wash them but just air them out once a year in the summertime in indirect light for an hour or so. They are machine washable, but that is really not practical because it's big and takes a while to dry. Spot handwash if soiled, but the sheet over it keeps it nice. Dampness really does just air out. If you expect a lot of heavy wetness such as bed wetting, use some extra absorbency between this and the sheet, such as a cotton blanket or a towel. That way you won't have to wash the wool. The cotton blanket will take up the flood and the wool will keep the moisture from going though and not have to absorb much so it will dry out quickly. The cotton blanket will wash up and dry easily so this really works well to protect your mattress and still be easy, comfortable and breathable. No sweaty waterproof fabrics and no outgassing. No sulfuric acid used in cleaning the wool; no mothproofing either. Twin size and larger do have straps at the corners for an easy and secure fit on your mattress. Please see more pictures and read more about these wool mattress pads on the wool mattress pads page. So far so good. Works as described. We got the porta rib size for my daughters full size bed. She’s done being potty trained but still has accidents once every few months when she’s tired. It doesn’t feel overly hot but is soft and comfortable. Thin enough that we can put it sideways on her bed so her bum is on top of the wool. So far we haven’t tested out how water resistant it is - I pray that won’t happen at all! But from what we can tell so far the material is great, and the company is great. Their instructions seem to be written by a mom so it’s easy to understand and just feel like a friend giving you her advice. easy to put on, even on a bunk bed, and they protect the mattresses well!